It is important that international students seeking jobs in Japan, like Japanese students, start collecting information and taking steps early. This program holds diverse events according to each step of the job-hunting process. The events include not only those targeting everyone, such as “Employment Guidance” and “Joint Company Information Session,” but also events specific to different groups, such as international students and those aspiring to become public servants. In addition, offers seminars for students to develop practical skills for the job-hunting process, as well as consultations with alumni. This program supports third and fourth year students through an extensive lineup of activities. The Career Center offers two broad types of supports: “career support” covering the period from the time of enrollment, graduation, to post-graduation careers; and “job-hunting support” to help students with their job-hunting activities. “Career support” provides students opportunities to discover what it means to live and work and self-reflect through curricular and extracurricular academic programs and internships. “Job-hunting support” gives students necessary tips throughout their job-hunting process. The Career Center helps students develop into independent adults and enter the real world as members that support society. The Career Center offers services to students of all years regarding their careers and job-hunting. Please feel free to make use of these services if you have any concerns or questions about student life, job-hunting, or anything else. Experienced career counselors are available to give students advice. Information collection is essential for job-hunting. 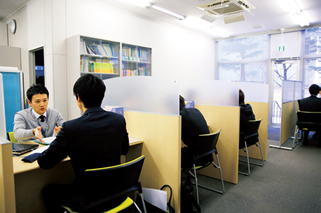 At the Career Center and libraries, students can access the Rikkyo Employment Navi, as well as browse and borrow books on careers and jobhunting. 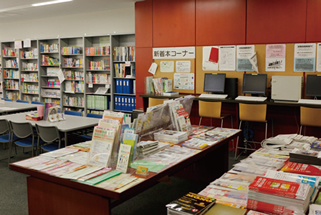 Students can also view economic newspapers, such as the Nikkei Shimbun, and economic magazines. Rikkyo University provides career design guidance (offered according to college or department) during the new student orientation. New students are able to listen to advice from alumni and upperclassmen, and to participate in group discussions with other new students. In this way, job preparation activities at Rikkyo communicate to students that a career should be about self-discovery?learning about oneself as an independent individual?and above all, about the importance of leading an enriching student life by setting goals and selfreflecting. These activities are designed to encourage students to form career aspirations soon after enrolling in the university. Rikkyo University equips students with the basic skills and manners they will need as working professionals. Our “career courses” are one example of such career skill support. A number of career courses have been established within the university-wide curriculum and the specialized academic curriculum of each college. These courses provide students an opportunity to examine their career paths from their first year. An internship is a program for students (typically unpaid) to receive training and work experience at a company. Students wishing to do an internship must apply on their own. For international students, internships will also provide an avenue to experience Japanese work culture and learn about business etiquette in Japan. 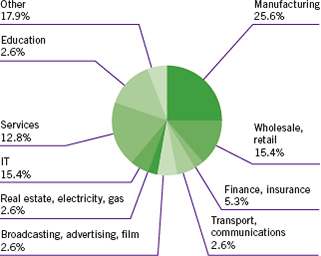 Many international students take advantage of internship opportunities. In principle, international students will take part in job-hunting programs with Japanese students. However, topics and information specific to international students will be explained at the “Job-Hunting Seminar for International Students.” These seminars are open also to those who are not in their third year of college when full-fledged job-hunting activities start, or in their first year of the Master’s Program. The seminar allows students to obtain information, knowledge, and experience necessary for employment in Japan at an early stage. Rikkyo University offers Japanese language courses that equip international students with Japanese proficiency needed for job-hunting activities in Japan, as well as Japanese proficiency required in business situations. Through these courses, international students can acquire the knowledge and skills necessar y for passing Japan’s unique employment exams (mainly the kokugo [Japanese] section), as well as learn about Japanese conversation phrases and writing methods needed for doing business in Japan. In addition, the Japanese Language Support Desk service of the Center for Japanese Language Education offers advice on completing job application forms and other forms in Japanese. Ningbo Hengkang Food Co., Ltd.